Meet Ellie, a sweet 11 year old Border Collie who loves hiking with her human Stephanie. Four of us met as strangers on the Pacific Crest Trail (PCT) this summer via Section J but finished as friends. One section of the trail is nothing but brutal scree for about eight miles all uphill. If you have done the Snoqualmie to Stevens Pass route then you know what I mean! We hiked separately but ended up meeting again and poor Ellie was barely able to walk. The scree, heat and elevation was a bit more than this little lady could handle. We grabbed our first aid kits and went to work on taking care of her just as we would anyone who needed the same aid. First aid kits are not just for the two legged hikers. 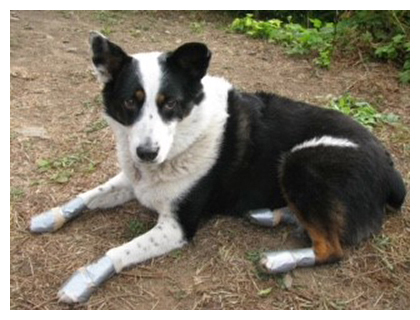 Cleaning her paws, gently placing salve on them, clean cotton gauze wrapped gently around her paws, secured by white medical tape, with a final wrap of good ole duct tape, and then giving her some Benadryl, she rested all night and by morning she gleefully walked out while all bandages remained intact and some sweet little booties. Today, Ellie is doing very well and continues to hike and run with Stephanie, all because we took our carefully planned first aid kit and used it for the fur baby. 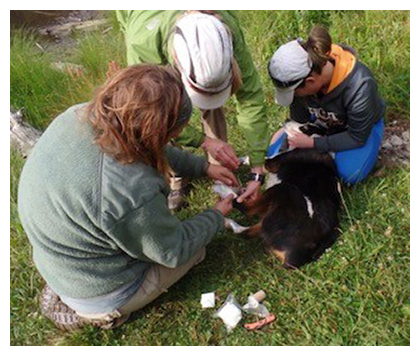 There is value in a well thought out first aid kit, don’t forget all the items you need for you and your four legged hiking partner. How gracious of you to stop and help Ellie.